So, the time is approaching. The time I’ve been dreading a bit. The one developmental milestone, that, for some reason, I was kind of hoping my son would reach later rather than earlier. It is almost time for toilet training. How do I know? Well, the little guy routinely sits on his little potty for a few minutes before bathtime. We read some books, chat, and that is that. But, lately, these nightly sits on the potty have occasionally become, shall we say, productive. Why am I afraid of potty training? Well, this is one area of parenting for which I think practical life experience is probably a lot more useful than reading about it. Perhaps the pediatrician in me is worried the mom won’t be able to do it “right”. I also have visions of mapping out the shortest distance to the nearest bathroom during every errand, trip, and walk. Diapers are just so easy right now. Messy, occasionally, but easy. But, as we say, toileting is one of the areas where the kids have much of the control, so if he’s getting ready, I better get on board. Maintains a dry diaper for a couple hours at a time during the day. Shows awareness and/or verbalizes that they have a wet or dirty diaper. Senses the urge to go, and then verbalizes that they need your help to get to the bathroom. Shows pride in small accomplishments. Has curiosity about the toilet. Able to follow simple instructions. Most kids aren’t ready for all of the above before 18 months of age. In fact, some studies have shown that children who were started prior to 18 months and, presumably, weren’t quite ready, took longer to achieve successful training. Buy a little potty and have them start sitting on it fully clothed for “fun”. Allow them to watch parents using the bathroom. Point out to child when you notice signs that they need to go or are going. 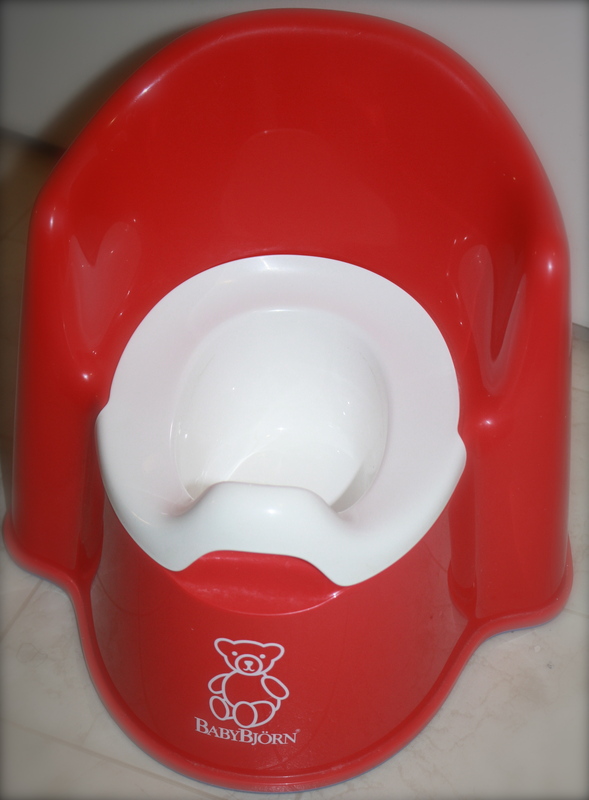 Start dumping stools from diaper into potty and allow child to watch or flush the toilet. Talk matter of factly about using the potty. Read books together about it. Most sources will recommend a “child-directed” method of toilet training. This method was first put forward by Dr. T. Berry Brazelton in the 1960’s. This method involves around one week of allowing child to sit on the potty fully clothed. Then, the transition is made to sitting child on the potty naked and encouraging efforts at voiding. Finally, the child should be led to the potty whenever child or parent anticipates the need to go. The child is praised for all successful efforts. After one week of success, child can transition from diaper to cotton underwear. Essential for this (and all) methods is making the potty readily available. Some experts even advise having more than one potty, especially in a multi-level home. The so called “fast-track” or “parent-directed” toilet training methods are mostly based on Azrin and Fox (psychologists) book Toilet Training in Less Than a Day. Their process involves devoting a (pretty intense) day to toilet training in two phases. Phase 1 involves pretend-play with a doll. You and the child put the doll through all the steps of using the toilet in a very detailed way. Phase 2 involves the child drinking lots of water and going through the steps of using the toilet just like the doll did. They also advocate rewards for using the toilet and a statement like “that’s not what big kids do” if the child has an accident. Variations on this theme can be found in more recent parenting books as well. For more information on this method, there is an excellent review at Parenting Science. Other parent-directed methods such as “timed-voiding” are generally not felt to be as effective as helping the child learn the cues from their own body. Having said that, it is probably a good idea to have a general idea of how long it has been since the last time your child voided in order to start looking for cues that they may need to go again. Treat constipation. Kids who find it difficult to stool will naturally resist efforts at potty training. If this is a problem for your child, increase the fruits (especially pears, prunes, peaches, apples), veggies, and water. If this doesn’t help, talk to your pediatrician. Have your child wear easy to remove clothing. Carry around extra pairs of underwear and pants in your diaper bag or purse. Buy some carpet cleaner. Accidents are to be expected. What about pull ups? Some experts advise that there is benefit in making the underwear “feel different” than the diaper. So, if you used plastic diapers you would transition to cotton pull ups and if you used cotton diapers you might try plastic pull-ups (although I’m guessing this might be a difficult sell for some families in both cases). This may take a while. Be patient with your child. Praise successes, but don’t punish mistakes. If you’re not making any progress after a month, take a break and start again later. Consider delaying if you or your partner doesn’t feel quite ready, you’re expecting a new child soon, you’re moving, or other big changes. There are lots of resources out there about potty training. Check out Dr. Greene’s advice for a “child-directed” approach and baby center has a pretty good review of the “fast track” method. There aren’t really any good head-head comparison studies of the two methods (let me know if you have found any). I would say your choice of method depends mostly on parent/child preference and personality. So, after thinking about all of this, what will we do? Well, given that he’s only 20 months, I think we’ll stick with what we’re doing for now. I’ll start pointing out when I notice signs that he is going, so that he starts to notice them too. We’ll look for a few books about the potty and read them together. And then, whenever we’re all ready, I’ll probably devote a weekend to a modified “fast track” method. Given that my husband and I are both softies, and that the mildly punitive part of the fast-track method doesn’t really sit well, I’m guessing it will take a little while. And, that’s okay. What methods did you use to toilet train your kids? What went well? What were the pitfalls? Do you ever miss diapers, or was it good riddance? Funny, motivating anecdotes welcome. This entry was posted in Development and tagged children, parenting, pediatrics, potty, toddlers, toilet training by My Two Hats. Bookmark the permalink. Great post. Good luck with what is to come. My pediatrician shared that in his experience there is often a window, especially for girls, that starts around 15 months to 27ish months that is good for potty training. That certainly vibes with what I have read from those who recommend the so called ‘three day method’ which is a bare-bottom approach. This is the method we used (starting at 19 months) and it has worked really well for us. Here is the last post I wrote a while back http://lovingearthmama.com/2011/09/13/3-day-potty-training-did-it-work-for-us/. I need to update it, now. She is pretty much ‘done’ now and has been since about 2 months of starting (although, yes, we still have accidents). The EC and early potty training people would certainly say you can start even earlier – and that is, afterall, what is done in most of the world (where diapers are not in ready supply) and it seems to work well there. My husband’s family who is Chinese, for example, had them all pooping on a potty by the time they were one. There are just so many ways to come at this and it seems, there really isn’t just one ‘right one’. May your potty learning journey serve to bring you even closer to your little one. Excellent point about many parts of the world where infant potty training is the norm, and definitely saves many diapers from heading to the landfills. The infant method is definitely interesting to me from a developmental perspective. I also really like your use of “potty learning”, sounds a bit nicer than training, doesn’t it? With my first, my son showed interest, and we slowly just started putting him on the potty all of the time. He had some accidents, but all in all it was a few month long pretty smooth transition, and he was solidly done a bit before 32 months (I remember, because that is when his brother was born and I remember being so thankful that he didn’t regress at all). He was my (excessively) hard and stubborn child, so I was sure that if it went well with him it would go great with my second. With the second, we had a deadline as the preschool we wanted him to attend had a potty trained requirement. I assumed that he would be on the same track as his brother, but not so. By three, despite us doing many of the methods above, he showed NO interest. In fact (funny anecdote time) we did a fast track type method where you basically hang out in the bathroom and offer them tasty beverages (juice) all day so they have to pee a lot, giving you a lot of opportunity for peeing. Instead, he met us with vomiting his juice all over the bathroom. Needless to say, we took a break after that day. We definitely kept pushing him (high rewards-suckers-for EVERY pee and poop on the potty) and a HUGE reward (GIANT LOLLIPOP) when he went a whole day without an accident. It still took forever (he became VERY stubborn over the situation), but the funny thing with him is that all of a sudden, he finally started to tell us he had to go, and has basically had one or two accidents in total since then, and his diapers at are night are almost always dry. You are probably wondering – we missed TWO preschool deadlines which was an issue only because we both work and needed the care. He finally made it on the third try – almost a whole year later than we had intended him to start. Nighttime potty training is a whole different game. My oldest didn’t stop wearing a pullup until the age of 6, while his three year old brother rarely pees at night. His doctor told me that we didn’t need to worry about nighttime bed wetting until the age of 8. FWIW – almost everyone I know who Pushed potty training didn’t end up anywhere faster than those who didn’t. Offering every opportunity and responding to their needs is absolutely important, but you def. can’t make them go before they want to. And it’s just the beginning of the rest of their toddler hood where they run so much more of the show than they ever did as a babe…. Thanks so much for sharing your experience. Definitely agree with your thoughts about not pushing before they are ready, which is why the potty training requirements for preschools and daycares are tough. The “potty-trained” requirement seems to put a lot of pressure on some families. “Elimination communication” is the term used for very early training of infants, with the goal of being mostly diaper free. There are various methods of achieving this, but it is quite common in other parts of the world. It relies on timing, cues, signals, and intuition. It is less a training method and more a method of increased parental awareness of a child’s needs. You can find more information on this at http://www.diaperfreebaby.org and other sites. In addition, babies naturally begin to hold their urine for longer and longer periods of time (i.e. diaper is dry longer) even prior to beginning to walk. Elimination communication is gaining favor in the US, especially with parents who tend toward attachment parenting. T. Berry Brazelton acknowledged that earlier control of voiding was possible, but also pointed out that having success with infant training might be difficult in families where both parents work out of the home. Thanks for sharing this – I can definitely identify with the sense of dread! Our 18 month old daughter started showing interest last December and I was not excited at all. The prospect of holiday travel and visiting, winter layers and snowsuits, accompanied by the inevitable accidents terrified me. All of a sudden cloth diaper washing seemed almost fun. But I somewhat grudgingly followed her lead, got a potty for each floor and dug out her big brother’s board books on the subject. Whether she picked up on my hesitance, was responding to subsequent upheavals in our family routine or just lost interest, things kind of tailed off throughout the spring. Great advice to work on this skill when the weather is nice! Thanks so much for your thoughts. As for potty training, the worst are the poopy (officially…medically….BM…I prefer poopy) underwear. Be prepared to either rinse or throw out. I prefer the throw out method, though I was known to try and clean them out too! I am not opposed to rewards, such as stickers on a chart. After only so many dirty underwear and not being able to get them off like a diaper (YES, I missed the convenience of diapers) I went to sticker collecting. When he collected five stickers for going poopy on the potty (I still have those charts by the way) he was able to pick out a tractor/trailer toy…within a reasonable price. I actually waited to train my son until after my daughter was born (3 years age difference). I didn’t want him to regress. With my daughter, I thought I would do the same, wait until she turned three. Well…she decided she wanted to take her own diapers off and potty train the week we were going on vacation. Not my idea of a fun, relaxing vacation. Somehow we managed to get through it without a full out training schedule. Yes, we made it through without any kid being sent away, we even survived one driver’s license. One down, one to go! Thanks for reading and sharing your experiences MK! Great to hear from you. For books, I would check out “The Potty Book for Boys”. L has really liked it. He has shown intermittent interest at various stages (starting around 18 months) but it never lasts for too long. In the end, he still seems to prefer the convenience of diapers and does not like to sit on the potty except when he’s in the mood. With his horrible diaper rashes, I sure wish he would show some more lasting interest! Waiting for something to truly motivate him since he has already shown himself to be a bit stubborn in certain things…. Little A also has a stubborn streak- definitely starting to tell us when he wants something and when he doesn’t. So, thanks for the recommendation! I’ll definitely check it out. Anything that makes the potty more interesting and fun will definitely help. We do EC with our son who is 9 months old. We started at 7 months. It sounds funny, but he seemed to know what to do right away. The book we read was “Diaper Free Baby” by Christine Koh. The book emphasized that 1. babies have an instinct not to soil themselves which you can take advantage of if you start earlier, and 2. you don’t need to be with your baby full time in order to try EC. At this point I put our little guy on the toilet (using a padded reducer seat which he prefers to the hard plastic potty) every morning when he wakes up, and he goes. Often that’s his only poop all day but if I can I look for signals in the afternoon and put him on if needed, I’ll also often put him on at other times and he’ll pee or do nothing. I don’t worry about training for pees at this point, and he wears diapers, but I feel like having this as part of his routine will make the training easier down the road… at least I hope! Sounds like he’s doing great! There are definitely times that I wish we had tried EC now that I’ve heard from many friends/readers who have had luck with it.